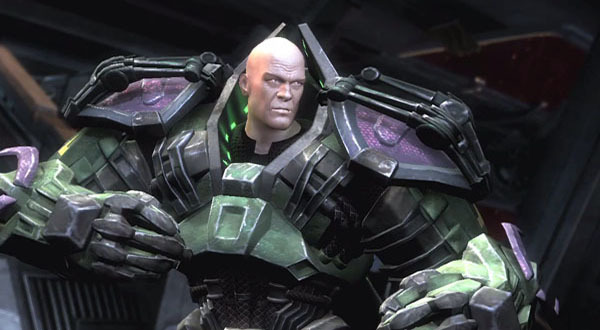 The newest trailer for Injustice: Gods Among Us drops players straight into the mind of Superman’s notrious arch nemesis, Lex Luthor, while also attempting to enlighten fans on what to expect from Injustice’s narrative. Over the course of the game’s storyline players will be thrust into the midst of an ever-changing power struggle that finds Lex immersing himself into the mysterious organization known as ‘The Regime.’ From the information released so far, it appears that the game will take players on a journey that pits two sides of a collapsed society against one another. The Regime could effectively be considered the bad, and ‘The Insurgency,’ led by Batman, appears to be those left still fighting for good. We all know that Lex isn’t the most charitable person in the DC Universe, so does it really surprise anyone that he’s simply out for his own good? It will be interesting to see which alliances are formed among the other heroes and villains, and the motivations behind each of our favorite characters. With a little over a month left until release, NetherRealm will surely be giving fans a better taste of the narrative very soon. Injustice: Gods Among Us will, without a doubt, be an epic clash of DC’s finest. As the days continue to pass, we’ll have more on Injustice, so be sure to check back soon. While you wait though, drop your thoughts on the Regime, and let us know which characters you think will join the mysterious organization!